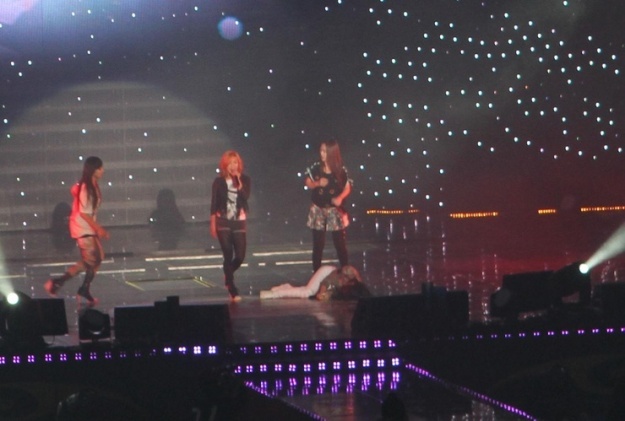 Krystal Jung of girl group f(x) fainted during a performance on November 27 at Lotte Duty-free Store Family Concert stage in the Olympic Gymnastics Stadium. She was quickly guided off the stage by security guards and the performance was ended. In a telephone interview with Newsen, SM Entertainment said that “her condition was not well today, which lead to her sudden fainting.” After being checked up at the hospital, they found nothing abnormally wrong with her. Here is a fancam of their performance. She faints at 4:50 into the video. After performing “Chu”, they were in the middle of performing “Mr. Boogie” when she fell. This entry was posted on November 28, 2010 by heedina. It was filed under Fancam, Girl Band, Live Performance, News, Showcase, Videos and was tagged with f(x), f(x) Krystal.